• 3 surge-protected outlets with 5610-Joule energy rating provide powerful protection for your workstations, printers, broadband modems and everyday household electronics. 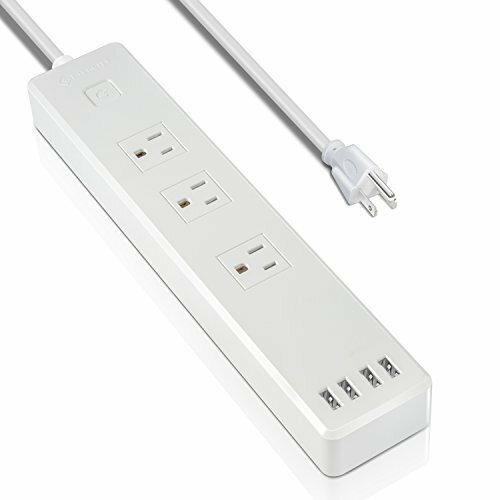 • The Etekcity 3-Outlet Surge Protector Power Strip with 4 USB Ports brings you a total of 7 outputs so you can charge 7 devices / appliances at the same time. • 4 USB charging ports intelligently detect the device and maximize the charging speed up to 2.4A/port, 6A max. • Widely compatible with PCs, Phones/Fax/Modems, Printers, Stereos, iPhone, iPad, Samsung Galaxy, Nexus, Kindle, Tablets and so on. • Heavy-duty 6ft power cord gives you extra freedom in terms of the placement. • 2 mounting holes can hang the surge protector on walls, baseboards if needed. • Widely spaced outlet design has plenty of room for up to 3 AC adapters. • Built-in over-current, over-voltage and short-circuit protection with the integrated circuit breaker. • Lighted on/off power switch with an integrated 10 Amp circuit breaker protect your devices from voltage spikes. Safety Protection: Recoverable surge protection and overload protection.